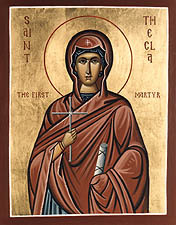 In Acts of Paul and Thecla A 1:14 (44:14) the phrase ἡ ἁγία μάρτυς Θέκλα, “the holy martyr Thecla” appears. The meaning of the word μάρτυς evolves over time from the act of testifying to dying for a cause. Around the time of the composition of Acts of Paul and Thecla, the word was used to describe those individuals that suffered the penalty of death because of their testimony about Christ. This specialized meaning is even attested later in Acts of Paul and Thecla A 2:1 (45:1) where she is called ἡ τοῦ θεοῦ πρωτομάρτυς, “the first woman martyr of God.” Surely we are not to think that she was the first woman to simply give witness to the truthfulness of the Christian gospel. Something more is in view. What makes the use of μάρτυς interesting here, though, is the fact that Thecla never died as a result of her testimony. It is said that she was burned at the stake and was fed to the wild beasts in the arena only to be miraculously delivered by God. After these acts of testing, she lives another 70 years and dies, presumably, of natural causes. This entry was posted in Early Church Writings, Greek and tagged Acts of Paul and Thecla, Lexicography, Marytr. Bookmark the permalink. 1 Response to Thecla: A Martyr? Jacob, this is very, very interesting. I really appreciate this post.